The Atlanta Braves have just announced their intention to abandon city-owned Turner Field south of downtown when the team’s lease on the ballpark expires after the 2016 season and move to a new, mostly-taxpayer-funded stadium in Cobb County near the interchange of Interstates 75 and 285, the city’s beltway. The Braves have spun the move as an economic one, bringing the stadium closer to the center of their ticket-buying public, a claim that, as this graphic from the AJC shows, has some validity. 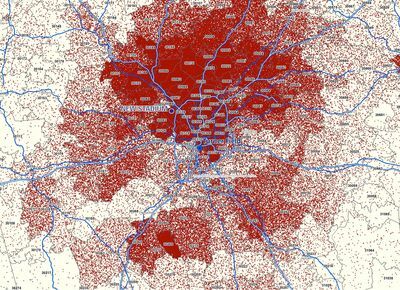 Ticket sales are heavily concentrated in the northside triangle of Buckhead and Cobb, Gwinnett and north Fulton counties. And the southside site is outside of that triangle. In transportation terms, Turner Field is admittedly far from perfect. It doesn’t have direct mass-transit access, and downtown traffic on the interstates has been a challenge. However, at first blush the Cobb County site compounds rather than solves both problems. Adding Braves traffic to an already clogged I-285 or I-75 northbound at rush hour to make a 7:05 first pitch — really? It sounds like jumping out of the frying pan and into the fire. So getting to the ballpark by car is not going to get a whole lot easier. How about transit access? Unfortunately, while Turner Field is not served by a light rail line, MARTA does operate a shuttle bus from the downtown Underground Atlanta development near the Five Points intersection of all four rail lines. I’ve taken it and it involves a walk through a downscale shopping center and a stroll across a street from the bus stop. I’ve taken it with a two-year old, and it’s convenient and easy. No, thank you, I won’t be needing the Enigma Machine today. This is not about race because nothing is ever about race. Indeed. Let’s not be tempted to look at two maps at the same time…. And let’s also ignore the fact that anyone from Atlanta who wants to catch a Braves game in 2017 will have to take their car across the Lester and Virginia Maddox Memorial Bridge on I-75 over the Chattahoochee…. So, while this move brings parts of the region’s history of white flight full circle by drawing out an anchoring regional institution from Atlanta, it also makes an ironic endpoint for an era of sports-related urban renewal on the south side, a history of promised revitalization that panned out more as community displacement. Reading this long piece by Rebecca Burns in Atlanta magazine a couple of things become clear: the Braves are at the center of a dysfunctional network of community and governmental entities that have consistently screwed up grand proposals to revitalize the Summerhill and Peoplestown neighborhoods that surrounded the old Fulton County Stadium, the 1996 Olympics complex, and current-day Turner Field (read this piece by Charles Rutheiser too). The area remains poor and predominantly African American, and if the ballclub today seems more inclined to walk away from the area, I suspect their fans, or the ones whose dollars they care about, can live with that too. as a best guess for how much the Falcons deal would cost the public, “more than half a billion dollars” is an excellent starting point. I can only imagine that Reed plans on being long gone when the NFL team bolts for greener (i.e. whiter) pastures in twenty years. This entry was posted in Uncategorized and tagged Atlanta, Atlanta Braves. 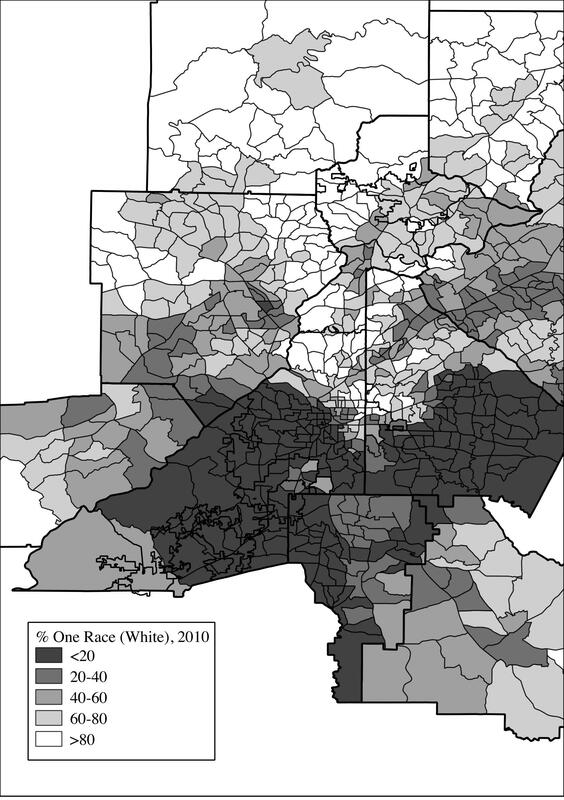 ← Atlanta, Detroit, and the End of Black Political Dominance in Cities?